The flowmeters model USR for liquids operate on the variable area flowmeters principle, which means that the installation position is vertical and the direction of flow is from bottom to top. The instruments have been designed as simple and thus economical measuring systems. The float for USR is a bomb form float, whereby the indication point is the top of the float. The appliance is available with valve. For centralised flow measurement, for example in cooling systems, we recommend the manifold flowmeters for multiple installation. 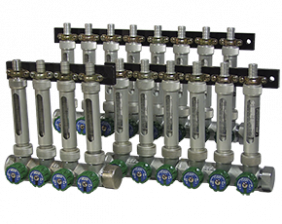 Up to 24 flowmeters can be assembled in a block provided that maximum flow rate in each unit does not exceed 10 l/min. The ranges and outlet connections of each unit in such a block can be determined separately.